Last fall, I was invited to participate in the NOVA Open Charitable Foundation’s auction for 2015. 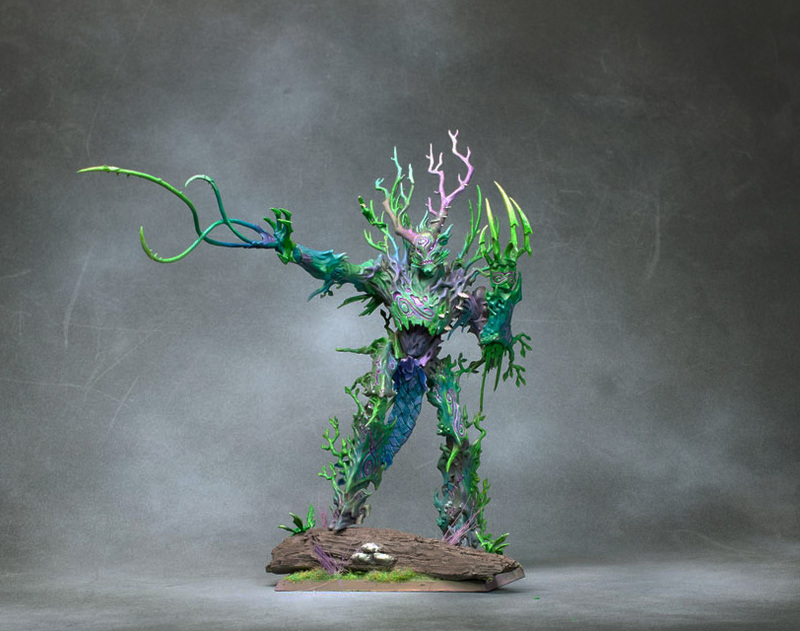 I was flattered to be asked to contribute to such an event and joyously poured over kits from my local hobby shop and picked out a Treeman from Games Workshop. The kit comes with three head and weapon choices. I’ve never gamed and have no knowledge of the characters, so I decided to magnetize the heads and weapons. I also wanted to offer it as a display piece as well as a gaming piece and the result is a base that pops out of the display plinth. Photography on this guy was an incredible challenge…. and that may be a whole other post. After numerous photos taken with many different methods, these are the pics I settled on. The odd color choice came from my indecision but the magical character quickly appeared and I figured out how I wanted him to look. Â I airbrushed some colors that I liked and did the highlights, glazing, shading, etc, by brush. Â He was such a different project. I hope he does well at the auction and gets to go home with somebody.